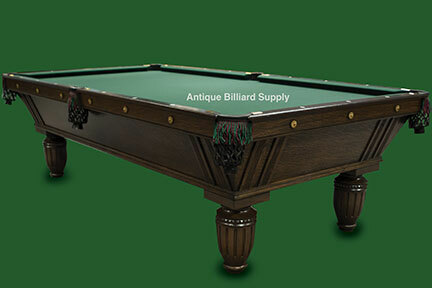 #1-15 Classic style of this Brunswick antique pool table makes it a stunning addition to any billiard room. Quarter-sawn oak construction with diamond-shaped sights. Darker Spanish oak color as used in old mission style decor. Large, fluted legs add to the mission-style appearance. Nine foot size, three piece slate playing surface. Ready for immediate delivery.